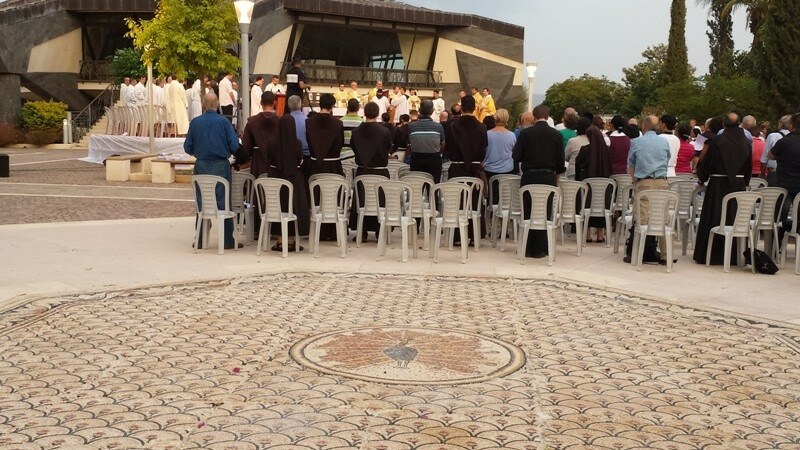 home / Multimedia / The Holy Land in news / Capernaum’s Byzantine mosaic: brought back to life through ..
On Saturday 11th October, friars and pilgrims descended on Capernaum for the annual blessing of first fruits. It was a day of celebration for a number of reasons: a reconstruction of the Byzantine mosaic found in the house of Peter was installed for the occasion, produced by the young mosaicists of the Mosaic Centre Jericho. The remaining intact sections of the mosaic have been faithfully reproduced, while the missing parts have been skilfully recreated. Capernaum is the home town of apostles Peter and his brother Andrew, and of John and James, the fishermen sons of Zebedee. It’s likely that Jesus lived in Peter’s house in Capernaum at the time he cured Peter’s mother-in-law and the paralytic who was let down through the roof. Capernaum was later destroyed by an earthquake, probably during the 8th century. Following the crusades in the Holy Land, it fell into a state of abbandomnent and disappeared completely. In the 1960s, Frs. Stanislao Loffreda and Virgilio Corbo discovered the remains of a Byzantine church adorned with mosaic pavements. The mosaic, which was very similar to the mosaics discovered in nearby Tabgha, was designed with geometric and decorative motifs, and at its centre lay a peacock, a symbol of immortality. The remains of this superb mosaic are currently being restored by the Mosaic Centre. The reproduction, located in the square facing the archeological area, has been hand crafted using ancient techniques; it’s the fruit of a labour which for years, continuing the legacy of Fr. Michele Piccirillo, has been in progress in Jericho and Sabastiya through the Mosaic Centre, a centre which trains young people in the art and restoration of mosaics. Though the task was demanding and laborious, today, the final product can be seen by thousands of pilgrims who come to the charming area of Capernaum each year. It allows them to discover the amazing art of the Byzantine mosaic, and to touch one of the wonderful embodiments of the Christian presence in this land.